Main reason for 5 stars? EVERYTHING. Incredibly flexibility and featured, all made extremely easy. I can’t imagine a better advertisement plugin. I am very thankful. Best plugin ever for advertizing… buy it right now!!! What a great ad manager, definitely the best one available! Look no further than this one. It’s easy, flexible and just about perfect! Rated 5 stars! Thank you for really great plugin! It works great and I use it extensively! you got 5 stars! Great! Everything I needed and more! Good job! This is a easy to use plugin, with great documentation and even better customer service! THANKS for your support… Highly recommended. I wish other developers on Code Canyon were as responsive as you. Really enjoying this plugin, everything is working well! Thanks Tunafish, five stars! I will look no further! The adzone system and the ease of use make this a pleasure to setup and manage! The mobile device support is seamless too! Easy manage on mobile devices makes this system stand out! Start monetizing your project or grow your existing revenue, with Adning you can sell ad zones on your website directly to advertisers. The whole process runs automatically and you’ll keep full control over the AD content and pricing plus, you keep 100% of the income! For the payments, a fully automated checkout system is included or… just use WooCommerce. Yes, Adning integrates with Woocommerce to sell advertisements and handle payments on your website. That way you can benefit from worlds most popular e-commerce plugin and take advantage of all their payment gateways. Use the built-in Google AdSense functions to manage AdSense banners on your website. Adzones make it possible to group banners and show them as a slideshow with fancy animated transitions. You can place adzones anywhere you want on your website and assign banners to them at any time. 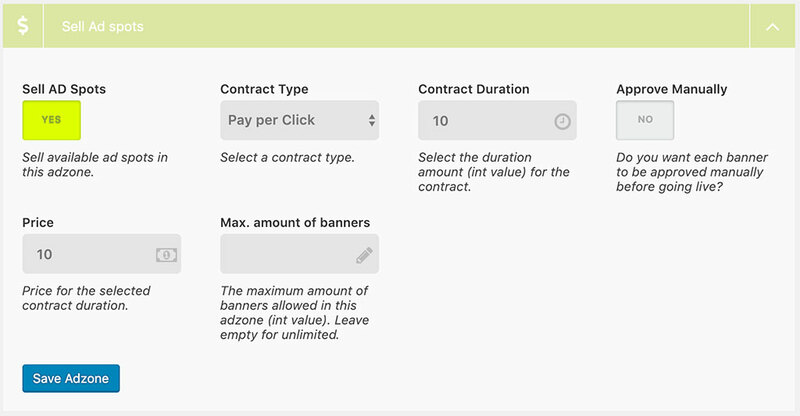 Using campaigns you can manage a whole group of banners/adzones and show them only during the timing of a specific campaign. Campaigns can also be set to run in specific countries only. We made sure you can really add banners to your website anywhere you want. There are 5 ways to put banners and adzones on your website. 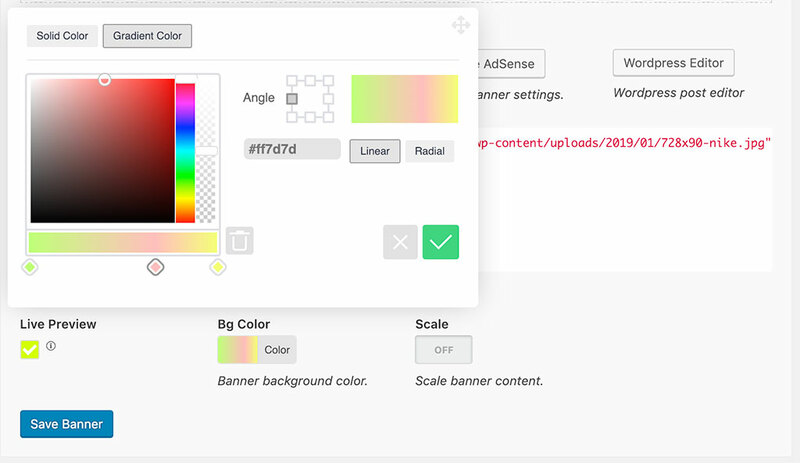 Automatic: Adning makes it very easy to add banners and adzones anywhere on your website automatically. Embed Code: this option even allows you to take your ads outside of the main website. Now you can place your ads on every website you want but still control them from 1 admin panel! Adning makes it very easy to manage banner advertisements for all custom post-types. It has all the tools to auto-place ads for specific posts under any custom post type. Make money with your website! Start selling ad spots and allow users to manage their own advertisements on your website. Payments can be handled by our custom checkout system or… just let Woocommerce handle your payments. Make sure your visitors don’t get to see inappropriate advertisements. Show specific relevant banners based on the user’s device, operator, cellphone brand or country. Show/hide specific banners for specific countries. Adning has very detailed user country detection (Geo Targeting) software. You can easily prevent visitors from specific countries to see specific banners or messages. Adning makes it very easy to hide all ads from users with a specific role/capability. This function is very handy for websites working with membership levels. Monetize your website content by showing advertisements before making the actual post/page content visible. Fly in ads are similar to popup advertisements but they can be positioned anywhere on the page, overlaying the content. Create beautiful non-intrusive parallax scrolling ads that merge into your content. Parallax banners can have an image/video background and a floating HTML object inside. Parallax Scrolling advertisements are a very user-friendly way to show banners in your content. Grab the users attention by showing some surprising and attractive corner ads on your website. Manage banner advertisements for your WooCommerce product pages. Adning makes it possible to show specific banners for specific WooCommerce products automatically. Since the new European General Data Protection Regulation (GDPR) you may want to hide banner ads till the user approves your content. Adning has built-in options available to do this. Show ads on every subsite for your entire multisite network but control them all from the main site. Adning makes it super easy to control banners all over your multisite network. - Added custom probability (weight) option for showing random banners in adzones. - Added custom CSS option to adzone settings. - Improved positioning settings for popup banners. - Fixed issue with banners not showing on IE. - Fixed issue with multiple instances of adzone on the same page. - Fixed plugin activation error on some servers. - Fixed output_collect_footer static error. - Fixed loaded banners js stats for popups. - Fixed cannot read property 'currentSTyle' of null JS error. - Fixed issue with banners moving to last position in adzones after editing them. - Improved collected js for the admin area. - Fixed issue with auto updates. - Added option to track stats using Google Analytics. - Added banner duration option. - Added option to hide all banners from post page (meta-box). - Important folder name changes. - Improved imgMCE integration (needs imgMCE v1.2.4 or later). - Added background color option for banners. - Added parallax fallback background option. - Added option to create banners using the default Wordpress post editor, Gutenberg or any page builder. 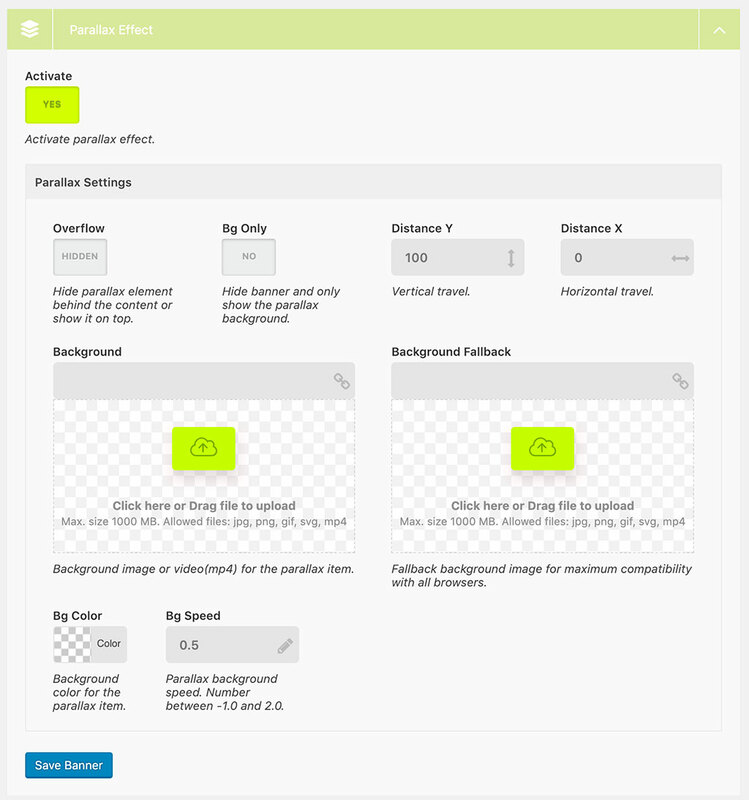 - Added parallax scrolling effect options for banners and adzones. - Updated new coloringPick version. - Added automatic add-on installation functions. - Added option to allow scrolling thru adzone ads. 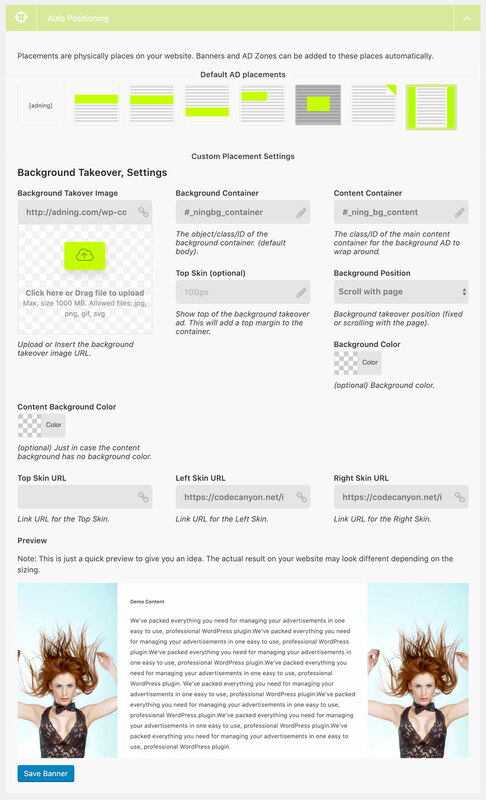 - Improved responsive design for adzones. - Improved collecting stats to prevent caching issues. - Improved parse args function for deprecated PHP each function. - Fixed some small random bugs. - Added WooCommerce Checkout to payment options for selling ADS. 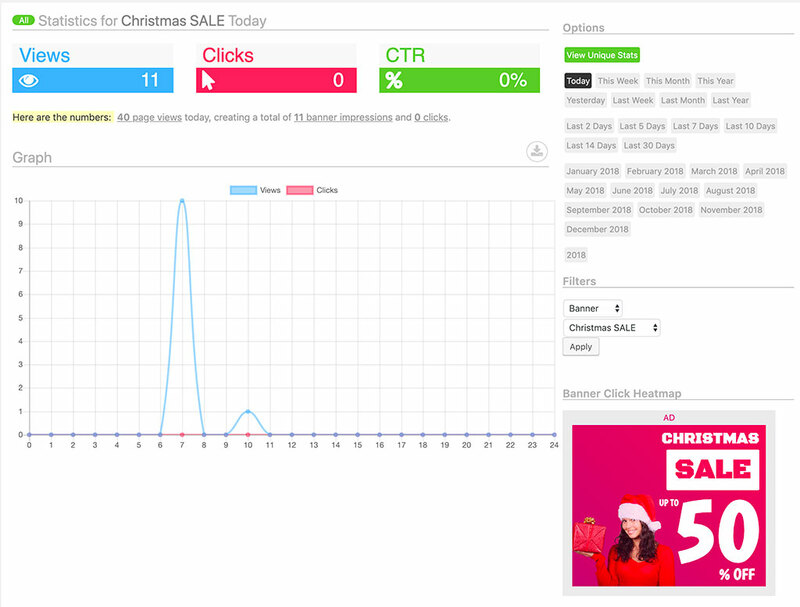 - Added click stats for BG ADS. - Added repeat option for in loop and in content ADS.